ACROTORQ NA Series of electric actuators are particulary suited for quarter turn applications in piping, ducting and in various plants such as water treatment, pulp, paper, ship building and air conditioning combined with ball, butterfly, plug valves and dampers. Its compact and simple design will ensure reliability and quality for customers even in hazardous locations. ACROTORQ NA Series of electric actuators give the best automation solutions to you with its various models (60Nm ~ 2,500Nm) and options. Standard enclosure with o-ring sealing is watertight to IECIP67, NEMA4 and 6. 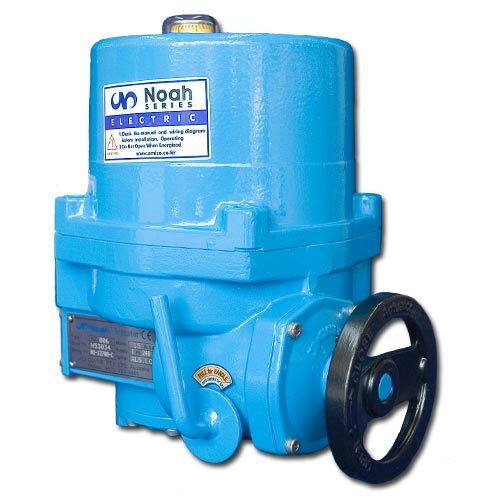 The actuator is available with optional explosion proof enclosure. Electric wiring of control circuit is standardized for single and three phase power supply in a single module. Multiple terminal contacts sufficiently cover additional requirements such as auxiliary contactors for DCS, interlocking and other options. Mechanical and electrical module can be separated easily to improve assembling, maintenance and alteration of electrical requirements. Actuator has enough internal space for optional accessories. Size of handwheel is designed for safe and efficient emergency manual operation. When operated the manual override lever engages the handwheel. Manual override is automatically disengaged when motor power is applied. Base mounting is standard to ISO 5211. Drive bush is removable for machining to valve stem requirement. 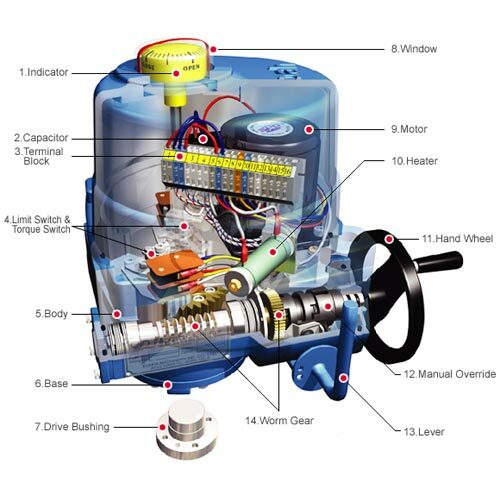 The actuator position on the valve can be selected for 4 positions by means of 4 bolt holes in the drive bush. A space heater inside the actuator prevents condensation due to temperature and weather changes. Standard 200W heater keeps all electrical components in the actuator clean and dry. The limit switch is activated by means of a simple and yet reliable cam mechanism mounted and driven by the center column. 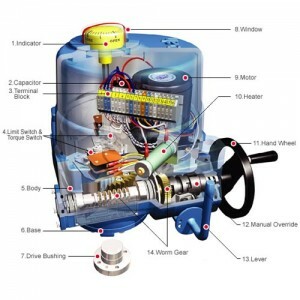 The valve position can be accurately and easily set with a simple adjustable switch mechanism. The set position is permanent and is not affected by over- travel resulting from manual operation. Cam activated torque switches are easily adjustable to provide over-load protection. Rolled steel wormgear on aluminium bronze wormwheel self-locks to prevent valve back drive on control signal or power failure and transfers high torque with high efficiency at low sound levels.